March 18, 2018 - Adiel Kolman, 32, a father of four, was stabbed by a terrorist in the Old City of Jerusalem while on his way home from work. Adiel Kolman, 32, a resident of Kokhav HaShahar in the West Bank and father of four, was seriously wounded Sunday afternoon when he was attacked in Hagai Street in the Old City of Jerusalem. He was stabbed by a terrorist on his way home after leaving his job at the City of David museum in the Old City. He sustained multiple stab wounds to the upper body and was taken to Jerusalem’s Shaare Zedek Medical Center for treatment, but died of his wounds on Sunday evening after hospital personnel spent hours trying to stabilize his condition. 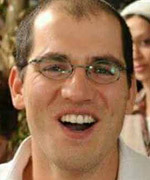 Kolman grew up in Moshav Keshet in the Golan Heights. He is survived by his four young children and his wife, Ayelet. His funeral took place this Monday morning in the Kokhav HaShahar cemetery.